For those of us that have no problem throwing a baseball, it seems like a simple thing to do. But if you have never done it, or you are young and shy, it seems terribly hard. Different parts of your body have to work in rhythm. Until you get your arms and legs working as one, everything feel awkward. And awkward doesn't get the baseball thrown very far. Throwing a baseball is more than just picking up a baseball and cocking your arm back and letting it fly. The results you are looking for in throwing a baseball are throwing with accuracy, throwing it with some velocity, and throwing it in a manner that does not hurt your arm. If you know the right steps to throwing a baseball, then doing all of the above correctly is not too tough. Before we start talking about the throwing mechanics, let’s talk about how to hold the ball. The best way to hold the ball for throwing is across the seams. The seams make a horseshoe image and you want to lay your fingers over the top of the horseshoe. Of course this is only if you have the time to adjust your grip on the ball. When you are playing in a game, you usually won’t have the time to make that adjustment. And when gripping the baseball, do not let it sit in the palm of your hand. You should hold the ball with your finger tips. You want to be able to grip it hard, but not so hard that the release is slowed down. So grab the ball out of your glove with your finger tips and thumb and get ready to throw it. Let’s move on to throwing with accuracy. Throwing a baseball accurately involves your eyes, your wrist, and your arm and legs. I see so many young players when throwing the ball not looking at their target. The no look pass might work in basketball, but in baseball eying your target is a must. When you are hitting, coaches tell you to keep your eye on the ball. When throwing a baseball they say keep your eye on the target. OK, you are seeing your target. Now, before you throw, you need to get your legs and feet set. Most of us watch major league baseball on TV. About the only time you see a throwing error from a major league player is when they do not get their feet set. Either they do not feel like they have time to adjust their feet, or they are off balance when throwing. You want your foot that is on your throwing arm side behind you, and the other foot out in front. And you want that front foot pointing right at the target. Your feet will line up your body, so with the front foot pointing at the target and the back foot directly behind it, your body is aligned with the target. This is going to help your arm come over the top and point directly at the target. 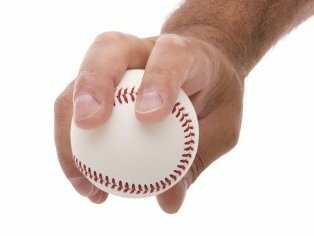 Once everything is lined up with the target, and the arm is in motion, then the last stage of accuracy is the release of the baseball. The baseball should come out of your hands right off of the finger tips. This should produce the straightest throw and also the fastest throw. You will have to practice playing catch to get down the correct release point. Trial and error works best for finding this spot in your downward arm motion. Since you are setting up your legs properly, be sure to use your back leg as a push off. This is where the velocity of the throw will come from. Getting your legs stronger and pushing off harder will keep increasing the speed of your throw. As far as making a throw that will not hurt your arm, there are two things to keep in mind. The last stage of throwing a baseball is the arm follow thru. As you release the ball continue the arm motion downward as far as possible. This motion helps send the energy created from the arm action out of your arm. Stopping the arm action earlier will cause the arm to jolt to a halt and this will result in arm pain and damage. The other thing to watch for in your throwing motion is be sure you are not twisting your arm. This can be so slight that the human eye will not notice it. If your arm hurts after playing catch and you are following thru good, then it possibility could be you are twisting your arm. You will have to have someone video your arm action and then play it back in slow motion. This doesn’t happen often, but keep an eye out for it. 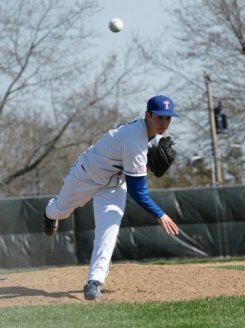 If you are looking for some throwing drills, check out this article "Baseball Throwing Drills".